Your habits are key to who you are and the change you want. Habits underpin what we do at Brilliant Living HQ.com and on the Changeability Podcast – mind management for your best life and business and how to make changes. Lasting change, i.e. achieving your goals – is not the result of a one off transformation but a product of daily habits. What do you want to achieve? What do you want to change? Whatever it is, getting it is the result of your habits. Habits play a role in what you look and feel like, in your success and relationships. 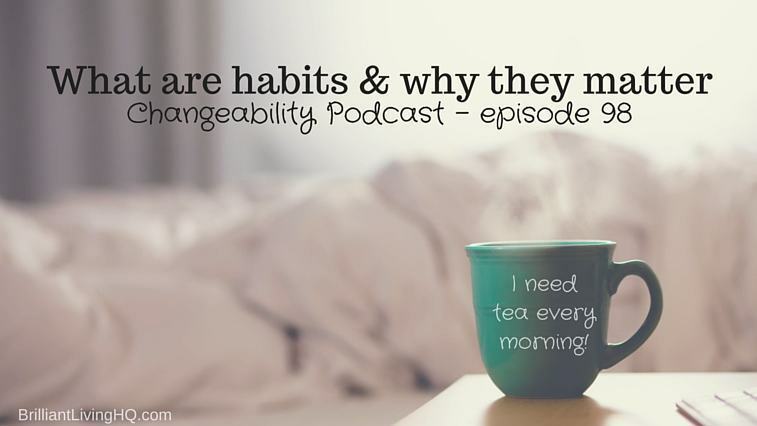 All of which makes it slightly surprising we’ve got to episode 98 of the Changeability Podcast before dedicating and episode to habits – but here we are and this is it. Habits are the things we do, but also and maybe as importantly, the way we think and what we believe. They include the self-beliefs that influence what we do, our behaviour and the actions we take. A habit is the repeated thinking and behaviours that become automatic, so we don’t mostly think about it. We need to know how we form habits in order to change them. Habits have certain characteristics or constituent parts that keep us doing them. There’s a cue that initiates the behaviour. A cue is a trigger, or reminder, something that triggers our thought or behaviour. Like the cue line in a play, (the line before you come in) which on hearing it reminds you to say your line, or triggers you to deliver your line. Then comes the routine. This is the behaviour or action that the cue has triggered – and the bit we think of as the habit. This is followed by the third part of a habit – the reward. This is the bit that is of benefit to you in some way, even though it might not actually feel like that, your brain is seeing it’s benefit. Because it’s a reward or benefit your brain wants you to repeat it and so you do until you’ve done it often enough it becomes a habit. This forms what Charles Duhigg in ‘The Power of Habit’ and Stanford professor B.J. Hogg in ‘Tiny Habits’ call the ‘habit loop’. Driving – remember learning to drive and how painfully slow it was having to think of each step every time. Whereas now it’s such an ingrained habit not only do you not think of each step, sometimes you can’t even remember driving somewhere. Getting in the habit of going to bed or getting up early or late. Eating certain types of food or at certain times of the day. Why do we tend to eat different things for breakfast to dinner? There’s not really any reason, it’s a habit born out of convention. Then there are the habits you think of as bad or unhelpful. Julian bites his nails and worse! If you want proof of the power of habit – if proof were needed – just look at your pet. Our dog Dude not only knows the time of day but exactly what should be happening in his world at what time and what order. Especially when it comes to food and walks. Habits help us manage our minds. Habits save us brain power – or rather free up our brains to do exciting creative thinking. Making habits out of the things we do repeatedly, our behaviours and actions – provides our brain with a power saving or effort saving mechanism. An automatic response requires less creativity and complexity of thinking from us. Habits matter because they hold great influence and sway over how we think, act and feel – which just about covers everything we do. We get into habits of thinking, doing and feeling. And because it’s the brain’ shortcut to behaving and feeling certain ways, it becomes automatic behaviour. This is great if it’s good automatic behaviour – but what if it’s not good behaviour? We’ve mentioned a few of our bad habits, those unhelpful habits that don’t support us in the changes we want to make and the way we want to live. And the truth is we all have unhelpful habits. That’s why habits matter. They matter to us because they are such a big part of who we are and what they do. The results of their influence is felt and seen in every aspect of our life and work. They help to determine how we feel and what we do. Habits underpin our mind management and how we can manage our minds to change what we do and how we do it. And habits matter because lasting change is a product of daily habits. The little small daily things we do that day in day out, week in week out and then month in month out, go into making the person we are – how we think, feel and act. In other words, we and our lives are the sum and result of our habits. What can we do about it? Before we think about how to change our habits – we need to identify them and decide which are helpful and which are not serving us in what we want to do or the person we want to be. The mind work is to take a day really notice what you think are your habits. Notice what you do and how you feel and note down a word or two or you’ll forget (you think you wont but you really will) and then determine if it’s linked to a habit and if that habit is helping or hindering you. To take it one step further you can relate it to the there being the three aspects of a habit. This will not only help you determine if it actually is a habit but also help you understand what triggers it, (the cue) how it shows itself (the routine or behaviour or action) and what that habit is doing for you (this is the reward and benefits bit). This will not only give you an increased level of self awareness and understanding but will put you in a good place to take forward some of next week’s suggestions when we look at how to change your habits. Hear us talk about all of this and a lot more – including some more of Julian’s unsavoury habits, on episode 98 of the Changeability Podcast. Thank you for reading or listening today. We appreciate you spending your time with us and if you appreciate us we’d love you to share this with someone you know. Send them an email or share on social media.